Australia is the home of skin cancer and the most common form of cancer suffered by Australians. Fair skinned people of all ages, especially the elderly, are particularly prone, as are those who live in beachside and coastal locations. 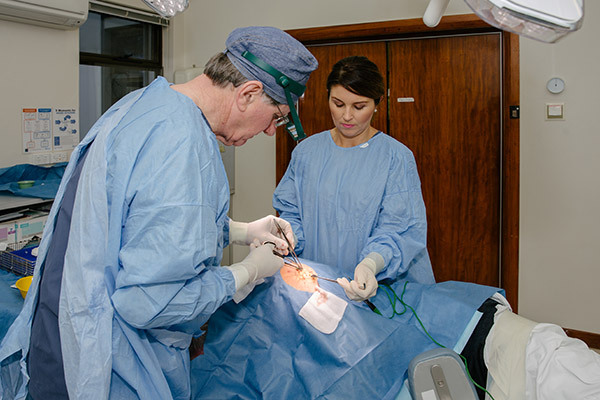 Dr. Richard Hamilton is one of Adelaide’s most experienced Plastic Surgeons in Skin Cancer . He has trained in Adelaide, New Zealand, Melbourne and Sweden. He has helped thousands of patients with skin cancer and related conditions over the years, and regularly performs skin cancer and mole removal in Adelaide. Under Dr. Hamilton’s expert guidance, you will receive clear and comprehensive advice, ensuring you’re able to trust in both his skills as a surgeon and his compassion as a highly qualified and respected medical practitioner. Surgery is the most common and successful form of treatment for skin cancer. Depending on the type of skin cancer present, you may require a surgical excision, or a surgical procedure involving plastic surgery to fully remove all cancer cells and minimise scarring. Being diagnosed with skin cancer can be immensely challenging, both physically and psychologically. Treating skin cancer can result in major alterations to your body, such as scarring and the need for skin grafts. Skin cancer surgery is designed to help you overcome cancer while maintaining the form and function you enjoyed prior to diagnosis. If you have a skin cancer or premalignant mole or lesion contact us today to find out how Dr. Hamilton’s skin cancer treatment at our Adelaide clinic can benefit you. If you require skin cancer surgery, contact Dr. Hamilton as soon as possible for an initial assessment, diagnosis and advice on the best method to remove all cancerous cells before they become advanced, or spread to other parts of the body. A referral letter from your GP or Dermatologist is required to obtain a consultation. Basal Cell Carcinoma (BCC), is the most common skin cancer and normally the least aggressive – but it can be especially dangerous in the face especially near vital structures such as the eye, on the nose and on the ear. They arise in what seems like normal looking skin and come in several guises, such as pearly nodules, ulcerated lesions which bleed (Rodent ulcer), superficial pink patches and even as pigmented lesions, which can be mistaken for a mole or a melanoma. Early diagnosis and treatment by an experienced Plastic Surgeon such as Dr. Richard Hamilton is strongly recommended to avoid tissue destruction and invasion by the cancer. Squamous Cell Carcinoma (SCC) is the next most aggressive skin cancer. If unchecked it can spread beyond the immediate vicinity to the lymph nodes. They may arise ‘de novo’ (without a pre-existing mole), or from pre-existing solar keratoses, which are crusty lesions in sun exposed areas of the body. They are common on the face, ears, lips, back of the hand and the lower leg. Invasive SCCs are usually fairly slow growing, tender, scaly or crusted lumps. The lesions may develop into sores or ulcers that fail to heal. Sometimes, however, they can grow very rapidly, indicating an aggressive behaviour and should be removed early by a specialist plastic surgeon. BCCs and SCCs are collectively known as non-melanoma skin cancers (NMSCs) and normally respond readily to surgery. Malignant Melanoma is the most dangerous skin cancer. If not detected early, it can spread to the lymph nodes and beyond that to internal organs. Melanomas can develop from benign moles or they can commence ‘de novo’. People with masses of moles and very fair skin are especially prone to developing melanoma. Early treatment by an experienced plastic surgeon is strongly recommended. Squamous Cell Carcinoma in Situ (Bowen’s Disease) is a superficial spreading form of SCC and if not removed may progress to invasive SCC. Merkel Cell Carcinoma (MCC), is a rare but highly aggressive form of cancer seen in sun exposed areas of the face and arms. It can look innocent early on but has a tendency to spread most rapidly. It may be triggered by a virus. Hutchison’s Melanotic Freckles (HMF) are superficial melanomas seen in the elderly, especially on the face and other sites. Sometimes called Lentigo Maligna or Melanoma in Situ, these lesions are very early melanomas at the pre-invasive stage. If untreated they become invasive and malignant melanomas. They are related to sun exposure and fair skin. They can range in size from 8mm to several centimetres. Any freckle on the face that is greater than 8 mm and has variable pigmentation and an irregular shape is likely to be an HMF and should be removed by a plastic surgery specialist. Early detection and treatment of skin cancer by a plastic surgeon such as Dr. Richard Hamilton is vital to your continued good health. Before surgery, you will have an in-depth consultation with Dr. Hamilton where he will examine the lesion carefully, check your skin generally and discuss your type of skin cancer and the treatment needed to remove the cancer. He will also ask about pre-existing medical conditions, any allergies, use of medications which may have a bearing upon the treatment, and what you can expect during and after treatment. Before surgery, it is possible that you will be asked to stop smoking, and avoid aspirin and other blood thinning medications, and avoid anti-inflammatory drugs including over the counter preparations such as omega 3 fish oils, glucosamine and vitamins which can increase bleeding at surgery. Today, there are two predominant methods of skin cancer surgery. The first, for smaller skin cancers, is the traditional excision, or the removal of the cancerous lesion and some surrounding healthy tissue. This is usually followed by the closure of the wound with stitches if the adjacent skin is healthy and lax. If the skin is too tight to close such as in the nose, eyelid, ear or hand area, or too tight and frail, such as in the lower leg, a skin graft or skin flap may be required to close the wound. With larger skin cancers in most areas of the body, the wound cannot be closed directly with stitches and Dr. Hamilton will proceed with reconstruction, using either a skin graft (healthy skin taken from another area of your body and transplanted to cover the wound) or by using healthy adjacent tissue (called a flap) to cover the wound. Stitches are used to secure the graft or flap in place. Whilst the prime objective is to remove all of the cancerous cells, attention is also given to making the scars as inconspicuous as possible. Dr. Hamilton will have the lesion examined by a pathologist with whom he works closely. The pathologist will prepare the specimen and examine it in detail under the microscope to confirm the diagnosis (the type of skin cancer) and judge that that all cancerous cells are removed. The pathologists’ work is crucial to the outcome and any future treatment planning – it occurs in the background without patients actually interacting with him or her, but is a vital part of treatment. Dr. Hamilton works closely with two pathologists; Dr. Jonathan Allin at Clinpath and Dr. Craig James at Adelaide Pathology Partners. These pathologists have many years of experience in diagnosis from examination of the tissues, and Dr. Hamilton relies heavily upon their unique skill. In some cases based on the pathology report and Dr Hamilton’s astute clinical judgment, additional treatment such as further excision and occasionally radiation therapy may be necessary. 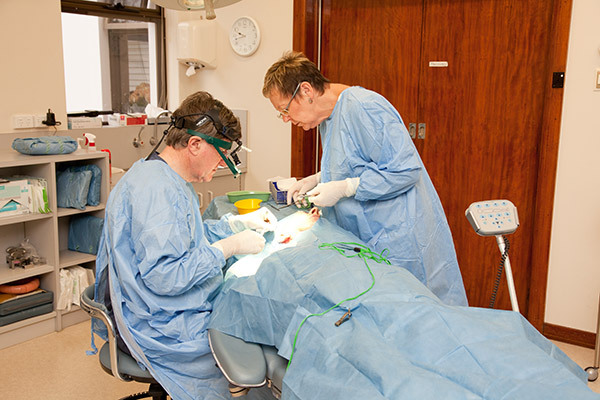 Most skin cancers are removed under almost painless local anaesthesia but occasionally sedation or general anaesthesia is used for larger lesions. All surgery is conducted at Hamilton House Day Surgery with the assistance of Dr. Hamilton’s caring and highly trained nursing staff. Recovery time after skin cancer surgery is generally short. Most patients may return to light activity the day of surgery. You will likely receive instructions on how to manage the wound. It may take a few weeks to fully heal, and may take possibly up to a year for the scars to completely fade. After healing is complete Dr Hamilton will undertake periodical skin checks to ensure that the lesion does not return locally or in the lymph glands. In certain cases Dr Hamilton may recommend scar revision treatment to improve scars, especially on the face. This can be carried out six to 12 months after surgery. To ensure you achieve the most aesthetically favourable results following your skin cancer surgery, we strongly advise that you visit a highly trained plastic surgeon, such as Dr. Richard Hamilton. While skin cancer clinics are useful for detecting and assessing the occurrence of skin cancer, they are often not staffed by trained plastic surgeons or dermatologists, and thus we do not advise you have any lesions surgically removed there. Instead, please obtain a referral to a plastic surgeon who is very experienced in successfully removing skin cancers while minimising scarring and disfigurements. This is especially important if you need to have any cancers removed from the face, scalp, hand or lower leg. As with any surgery, there are risks involved in undergoing skin cancer surgery. The information contained on this website is of a general nature and is not a substitute for an in-depth consultation with Dr. Richard Hamilton. Dr. Hamilton will carefully explain these potential risks and complications to you in detail at the time of consultation. Moles and Naevi are the commonest of the skin lesions, which can be present at birth or appear in childhood or early adult life. They can be flat or protruding and are seen on the face, arms, legs, back, chest and so on. They can develop or grow after sun exposure. A few moles have a tendency to change into a melanoma type of skin cancer so careful assessment is required to determine the risk. Moles at risk including Dysplastic Naevus can be recognised by the ABCDE rule: Asymmetry, Border irregularity, Colour variation, large Diameter and Evolving, and should be biopsied or removed and sent to pathology. Whilst most non-facial moles are removed by GPs and dermatologists, a plastic surgeon has a definite role in identifying and removing suspicious moles especially on the face and sensitive areas where there is a desire to obtain the best aesthetic result with minimal disfigurement. If you have an unsightly or suspicious mole on your face, ask to be referred to a plastic surgeon for removal of the mole. Dr. Hamilton has a proven record of effectively removing facial moles with almost imperceptible scars. Minimise your sun exposure to reduce the risk of developing skin cancer. Specifically, avoid sun exposure between 10am and 3pm when the UV intensity is at its highest. If you do go outside during these hours, ensure to wear sun protective clothing including a wide-brimmed hat and UV-protective sunglasses. Apply SPF30+ sunscreen regularly, particularly if swimming or perspiring. It’s also strongly recommended to avoid tanning booths. Dr. Hamilton’s surgical treatments can help you overcome skin cancer and be cured with minimal physical reminders of your surgery. Dr. Hamilton can help you determine which method of skin cancer treatment is best for eradicating cancer from your skin, as well as which method of reconstruction will leave the least amount of change to your appearance. Contact Hamilton House Plastic Surgery today to find out how skin cancer surgery at our Adelaide clinic can assist you.